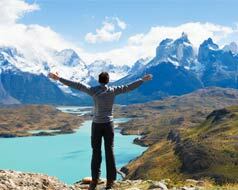 Here is the best way to describe Patagonia: a land of discoverers and adventurers. Once upon a time this land was ruled by Orelie-Antoine de Touenes the 1st, the self declared king of Araucania and Patagonia. Even in our day, his descendants are still claiming these lands and the throne. Today, the remoteness of this vast expansion of land is an elixir for the adventuresome traveler. Patagonia is a place where the young and not so young can experience the beauty of the towering Andes, the ice fields running along the Andes and never ending steppes. Challenging treks, hiking on glaciers, and mountains have always been the dream of the inquisitive traveler. This is the place where the traveler can find it. Patagonia extends from half of Argentina and Chile to the south and beyond to the Island of Tierra del Fuego, which translated means Land of Fire. A journey through this region takes you to the “Ends of the World” Ushuaia, the capital of the island and the southernmost city in the world. Spectacular mountains, dense forest of beech trees and glaciers dripping from the top of the Andes offer a unique experience where only those that see with the eye of the soul can enjoy. The awe inspiring Fitz Roy peak rises above the little town of El Chalten considered by experts the trekking and hiking capital of the Americas. This is the land where Butch Cassidy and the Sundance Kidd roamed while they robbed banks and escaped from the law in the United States. Follow the steps of Magellan, Charles Darwin and adventurers like Julius Popper, the king of Patagonia, and of course our own Butch Cassidy. We invite you to experience the magical and mystical land of Patagonia!